Mid-afternoon at a quiet time for the pub and it is a rare privilege to be able to sit inside in peace. But is £5:15 a pint a price worth paying for such a privilege? Redemption - Rock the Kazbek 4.00 A hazy golden, slightly sharp beer with excellent hop flavours. Mid evening before a meal at the excellent Vecchio Parioli restaurant nearby. Quiet inside but service slow, a jaw-droppingly limited real ale range and a mass of dirty glasses on the bar counter. Does not seem to have upped its game since Young's takeover. Mid evening before a meal at the excellent (and yet again I really and truly mean faultless) Vecchio Parioli restaurant nearby. Appalling short measure in this pub was still pretty much the same after a top up. Takes the shine off what could be an atmospheric venue. Poor training or cussedness I just don't know? 11:15 First stop on a crawl of pubs with historic interiors. Still busy with breakfasters. There were 14 of us so we filled the front bar. The Christmas tree decorated with pump clips was a nice touch. Mid evening before a meal at the excellent (and I really and truly mean faultless) Vecchio Parioli restaurant nearby. Robert and I splashed through the rain to this pub which proved to be very busy, uncomfortably so really, and we spent an hour or so not getting much beyond the doorway. Colchester - Anne Downes 4.40 A dark beer. Anarchy - Sinist*r 4.30 Full-bodied, dark and caramel, with a little bit of hop. Beautiful pub; a pleasure to drink here. Really good service. And a much more adventurous beer range than last time I was here. But all this pleasantness comes at a high price. Tiny Rebel - Cwtch 4.60 A red ale with an initial sweetish red fruit and malt taste but ultimately dominated by big hop flavours. Colchester - AK Pale 3.70 A fruity, light mild / pale ale. Colchester - Red Diesel 4.20 A sweet malt, caramel, toffee, red ale. 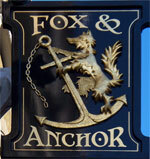 Girlfriends suprise birthday evening / nice at the Fox and Anchor hotel.. Wow.. I really must try one of their pork pies as they look lovely. The barmaid was singing Dire Straits as she was pulling my pint which put me in a happy mood. Harviestoun - Schiehallion 4.80 It was hot outside, so I can forgive the serving temp of this beer maybe not being as cold as I would have liked. Some tea flavour that can creep into Harviestoun beers. It's ok, just not as fresh as I remember it, cold and bitingly hoppy. Got better as I drank it, but at £3.45 a pint, can I have it colder? Not a bad pub. The tankards were a good touch. Seemed to be more orientated towards the food side of things. Purity - Mad Goose 4.20 Not my cup of tea really. Very bitter and not particularly easy to drink. 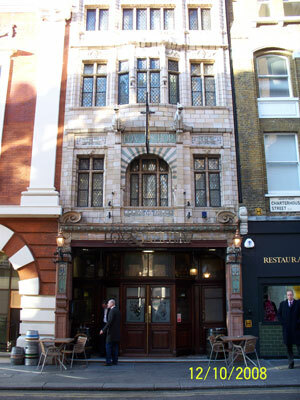 The pub is found in Smithfield, Central London, EC1M 6AA. Just off Smithfield market by Charterhouse. Long slim pub with the bar to one side and snug rooms at the rear. Fresh seafood for sale alongside cheese and pork pies. Six handpumps, some beers may be served in pewter jugs. Purchased by Young's Pub Company in Summer 2014. We have visited this pub 12 times, seen 51 different beers and tried 20 of them.